Eucyrtidium fastuosum [sic.] Ehrenberg, 1873a, Akad. Berlin, Monatsb. (1872), p. 309; 1873b, Akad. Berlin, Abhandl. (1872), Pl. 9, fig. 19. 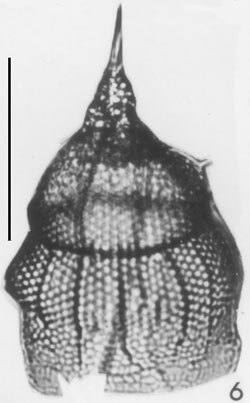 Phormocyrtis fastuosa [sic.] (Ehrenberg) Haeckel, 1887, Challenger Rept., Zool., vol. 18, p.1369. ?Eucyrtidium hertwigii Haeckel, 1887, Challenger Rept., Zool., vol. 18, p. 1491, Pl. 80, fig. 12. Basic structure of the cephalis, apical horn, collar pores, dorso-lateral lobes, and dorsal and primary lateral thoracic ribs the same as in Theoconus zancleus. The three, primary thoracic ribs raised in a few specimens and generally extend as short, thin, conical spies. Thorax longer and broader than in T. zancleus but with similar shape except for angular shoulders corresponding in position to the three primary thoracic ribs. Thorax separated from a broad, incompletely developed, cylindrical to truncate-conical abdomen by a distinct annular constriction and internal septal ring. Both joints characterized by small, equal, hexagonal to subcircular pores, regularly arranged in longitudinal rows and by numerous (8-15 or more), thin, longitudinal ribs continuous between the joints; ribs equally to subequally spaced, originate in the wall of the thorax below the collar region and are marked by narrow, low (2-5 µm), solid, continuous, keel-like ridges extending outward from them in a plane perpendicular to the surface of the test. Measurements; based on 6 specimens from stations 34, 46, 56, and 60: length of cephalis 25-31 µm, of thorax 64-80 µm, of abdomen 58-86 µm; breadth of cephalis 25-31 µm, of thorax 76-101 µm, of abdomen 113-135 µm; length of apical horn 31-37 µm, of vertical spine (not observed); of dorsal and primary lateral spines 0-12 µm. prohibits analysis of its complete range of variation. For this reason E. hertwigli Haeckel is placed only in tentative synonymy. Distribution. This species is very rare in the Gulf. It is present only at stations 34, 46, 56, 60, 91, 92, and 133. Its presence at only one station in the northern Gulf and its rare occurrence elsewhere indicates its preference for oceanic waters. E. fastuosum [sic.] Ehrenberg and E. hertwigii were reported from the western tropical Indian and tropical central Pacific Oceans, respectively. The Gulf species is apparently confined to tropical seas.